Winning and losing is a part of every sport. It is as inevitable as day and night. Even though everyone wants to play to win, there are always instances when even the best of sides end up on the losing side. And losing may not just be on the field, it could be off it too. We take a look at 5 such instances which caused heartache to many a cricket fan around the world. South Africa, chasing 214 in 50 overs for a place in the final to be played at Lord's, found themselves needing 9 off the last over to win. Fleming had the ball and Klusener was on strike. Klusener belted the first two balls of the over for boundaries to bring the Proteas to within touching distance of a victory. The next two balls though went in favour of the Australians. 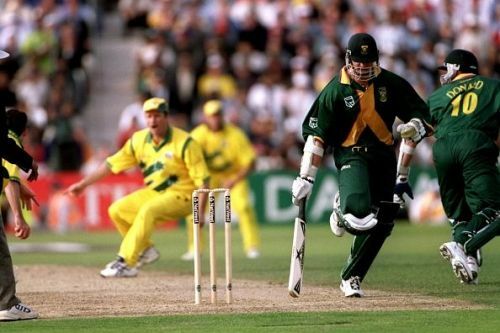 After nearly getting run-out the ball before, Allan Donald was left ball-watching as Klusener hit the ball to mid-off and charged away to claim a non-existent single. In a moment of chaos which resulted in Donald getting run-out, the game ended in a tie, sending the Aussies on the way to the final by virtue of having finished higher in the Super 6 stage.